Here I’m standing on the bed and leaning against the window being unhelpful as Bob looks at a map and tries to figure out the plan. 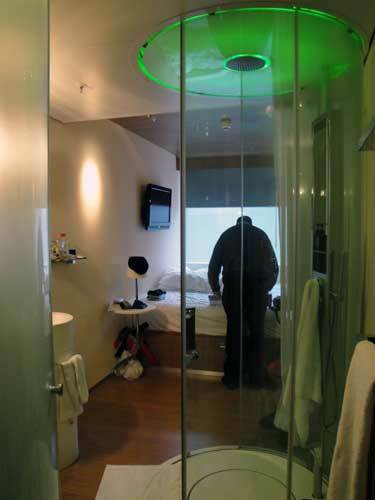 At this point I’d learned enough about the controls to make shower pod and toilet pod lighting green. Before I do my post about our tiny hotel room I need to add something that I meant to put in yesterday’s post. Co-worker indicated that he did not and the barista expressed great enthusiasm for this band. I’ve been to this coffee shop a number of times and I possibly could have given birth to this barista yet I am impressed at his wide-ranging knowledge of 80’s music. “That won’t be necessary,” he said, all grumpy and ungrateful. He didn’t even have a response for that. 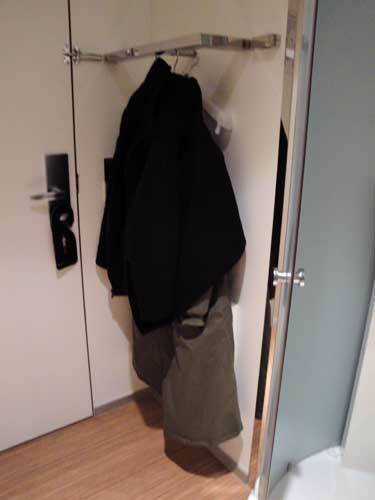 This is the hotel closet meaning just a rack with two hangers. This is the toilet pod. You pull those two “doors” around until they meet in the middle and hope your knees don’t bump. Nothing private in here. You can kinda see the sink at the right. Here I’m standing with my back against the door. You can see the TV above the bed and the tiny shelf on the left wall. The shower was pretty cool. 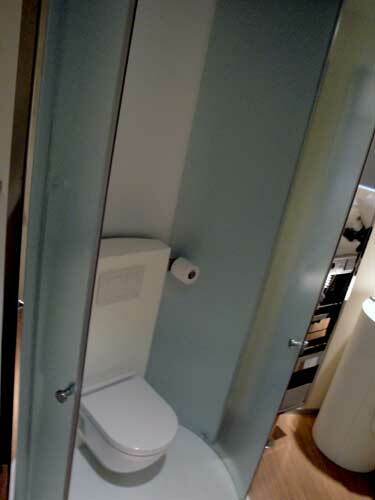 The toilet “doors” are frosted but not the shower. That round thing up in the center is the showerhead. There’s also a handheld sprayer. They provide two kinds of soap: daytime and nighttime. I preferred day. Bob used a blend. I stupidly didn’t get any photos of the downstairs area with the bar and couches and work areas. One night I sat downstairs and had a beer and wrote in my travel notebook which I did an overall crap job of keeping up with. There was another man working and he asked to use my pen. When he returned it he commented on how old fashioned it was to be using a pen and paper. ARGH! We live in a world where pen and paper is considered old fashioned. That's an awesome room! Especially the shower. When we stayed in Amsterdam the hotel was huge but everything inside it was so tiny. The elevator could maybe hold 2 1/2 people on a good day, and felt like it was being hand-cranked up and down. I remember the bathroom being a good size but that it took me an hour to figure out how to get hot water in their tiny bathtub. K – "spitingi"!! Sounds like something Italian. "I'd like spitingi with meatballs, please." Although maybe I'm not too excited about eating spit. Hopefully the meatballs cover up that taste. I am obsessed with the hotel room. Oh wow. That hotel looks completely different from how I pictured it! It looks pretty cool, in fact.